Brooke started working in Return Design as an intern during the Spring of 2014. Among the many clients she worked with, she spent a lot of time with Forgotten Voices and Influence International. Brooke has worked on everything from creating identities and brochures, to designing logos. She cites this work experience as integral for her continued growth as a graphic designer. BROOKE DISCUSSES A PROMOTIONAL CHRISTMAS PIECE FOR FORGOTTEN VOICES WITH PRESIDENT RYAN KEITH (LEFT) AND RETURN DESIGN DIRECTOR, TIM FERGUSON SAUDER (RIGHT). A naturally gifted dancer, Brooke has always been creative, but Return Design helped her learn how to channel this creativity into an effective means of storytelling. Brooke was involved throughout the entire creation process; from initial meetings to the delivery of final files. This exposure introduced her to the holistic approach to design and the importance of creating an effective brand even within a non-profit context. After her first semester in Return Design, Brooke spent a summer in Swaziland. 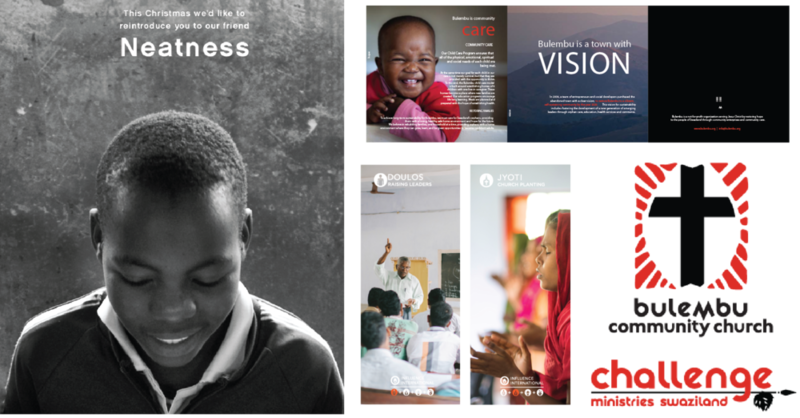 Following a one month service project, she stayed on with Bulembu Ministries to offer free design help. In 2001, the mining company that had sustained the community of Bulembu closed its doors leaving many jobless. The ministry was founded when a team of entrepreneurs purchased the abandoned town with a vision. Bulembu Ministries is committed to creating sustainable enterprise and a vibrant community in Swaziland by 2020. It was during this experience that Brooke really saw the value of her RD internship. "I knew what I had to offer and what the organization needed. Return Design taught me how to recognize gaps within a brand and then find solutions through graphic design." During her time there, Brooke was able to create a promotional brochure and several logos for sub-brands within Bulembu. Through her design, these enterprises and community centers have funded the town of Bulembu and helped the organization grow closer to its goal of complete sustainability by 2020.